And we’re back! I’ve kicked the pneumonia out of my lungs and am back at 100%, so updates will resume on Wednesdays once again! Thanks for your continued support. Messenger will also update later this week, too. As a side note, if you are also a Messenger reader, or just a fan of Chios, I’ve created a new minicomic ebook called “Best Friends,” available for $3 on Gumroad about how Eldora met Icy. It’s 19 full-color pages, optimized for iPads and other tablets and so on. 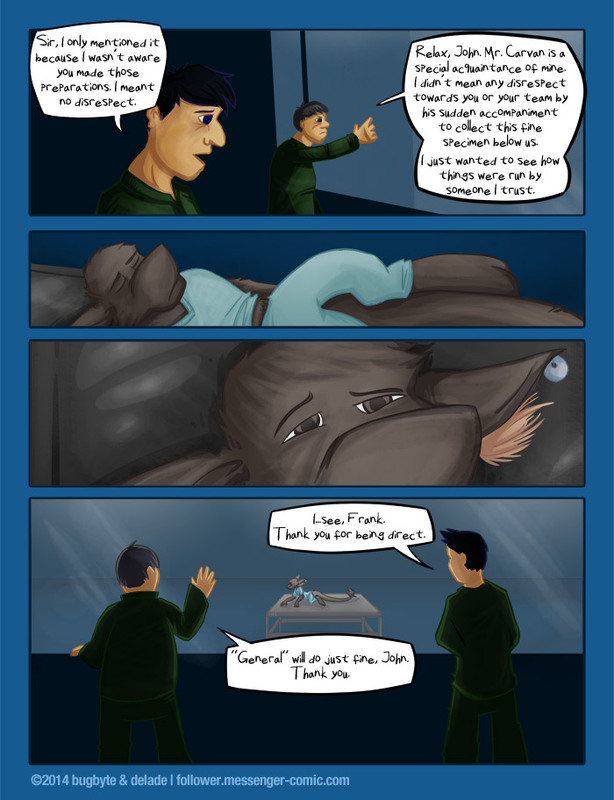 Panel 2: The creature lays unconscious, sprawled out on the gurney. Panel 3: A close-up view of the creature’s face. The creature begins to awaken, slowly opening his eyes. Panel 4: The two men are silhouetted in the darkness against the bright room through the window. We can see the creature starting to sit up and gather its surroundings.